By reducing the costs of roll-to-roll technologies, researchers with the EU-funded R2R Biofluidics project have opened the door to using R2R to develop novel diagnostics for rapid and reliable pathogen detection. The consortium of R2R Biofluidics has set up the first pilot line, which combines R2R imprinting of microfluidic structures with subsequent biomolecule printing by R2R Microarray Spotting in October 2018. For this purpose, the project partner SCIENION developed a customized sciFLEXARRAYER which was included in a new R2R pilot line at JOANNEUM RESEARCH. R2R microspotting will now be used for test production of biosensors as well as next generation cell culture substrates – aiming at future high volume manufacturing at dramatically reduced production cost. 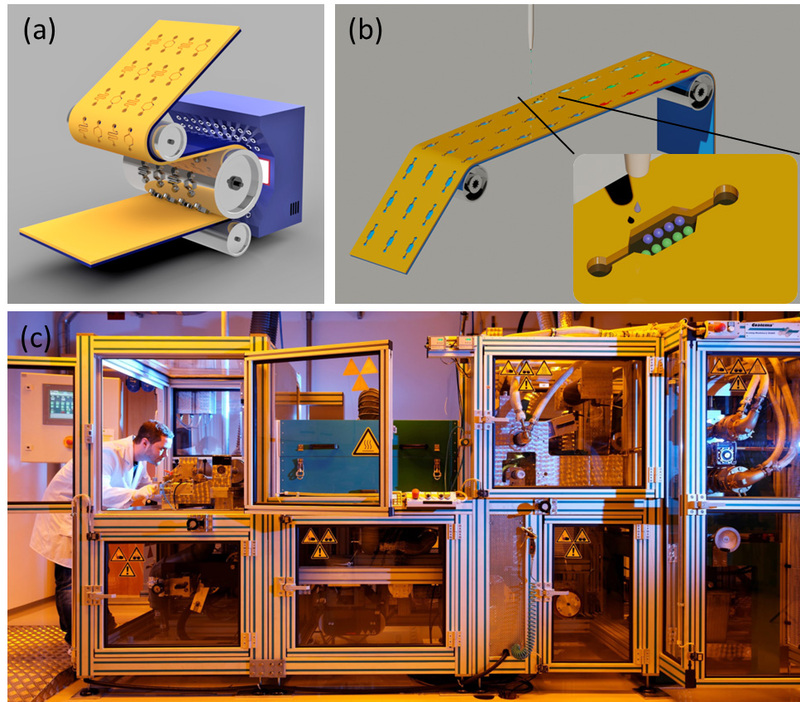 Figure 2: Schematics of R2R imprinting (a) and R2R microarray spotting (b) together with the R2R facilities of JOANNEUM RESEARCH – MATERIALS (Weiz, Austria). Images: JOANNEUM RESEARCH. The R2R Biofluidics project has received funding from the European Union’s Horizon 2020 research and innovation program (grant agreement n° 646260). More information: www.r2r-biofluidics.eu. The pioneering work of the EU-funded R2R Biofluidics project has been awarded with the Austrian Fast Forward Award 2018. The project consortium aims at the development of novel production lines for lab-on-chip devices based on high throughput Roll-to-Roll (R2R) nanoimprinting in combination with complementary printing and manufacturing technologies. Roll-to-Roll (R2R) technologies are well-known in manufacturing processes of the graphical printing industry and are nowadays emerging in several other areas. The EU-funded R2R-Biofluidics project has been set up to exploit the potential of roller-based imprinting techniques for production processes in the diagnostic and bioanalysis industry, predominantly for manufacturing microfluidics for lab-on-a-chip devices. These products are needed in high quantities and R2R technologies allow for a significant reduction of production costs. Targeted application areas are diagnostics, drug discovery and food control. The eleven R2R Biofluidics project partners jointly develop a completely new process chain for large scale production of selected lab-on-a-chip devices suitable for point-of-care applications, e.g. for detecting antibiotic-resistant pathogens. The novel chips designed for chemiluminescence detection provide improved sensitivity thanks to imprinted optical structures. R2R fabricated microfluidic channels will significantly reduce production costs while maintaining high throughput production. A second goal of the project aims at developing cell chips containing imprinted cavities and micro- to nanoscale channels for controlled neuron culturing to be applied in high-throughput drug screening. Very recently, the partner SCIENION developed a customized microarray non-contact dispenser for biomolecule printing. This device was successfully included in the R2R pilot line for high throughput production of biosensor and cell culture chips. 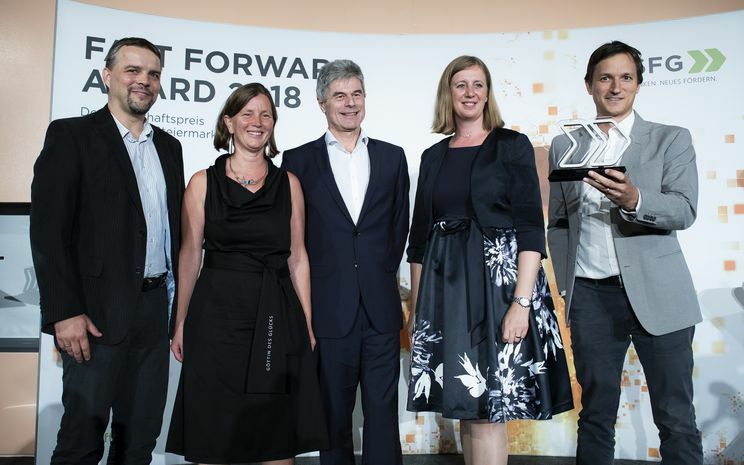 In September 2018, R2R Biofluidics received the Austrian Fast Forward Award 2018 for the pioneering work to develop novel diagnostics for rapid and reliable pathogen detection. This innovation prize of the Austrian region Styria was awarded to JOANNEUM RESEARCH, coordinator of the R2R Biofluidics project. Figure 1: R2R Imprinting of Biosensor chips by Ultraviolet Light Assisted Nano Imprint Lithography (UV NIL) (a) together with a fully assembled Biosensor for detection of antibiotics resistant bacteria (b). Images: JOANNEUM RESEARCH. This project has received funding from the European Union’s Horizon 2020 research and innovation programme under grant agreement n° 646260.